I am a HUGE fan of Italian food and Lasagna is one of my favorite dishes. I rarely make it at home, because it is quite time extensive and you can’t get away with just making a small quantity of it. This rawsome Lasagna is delicious and ready in an instant! The pesto and the vegan cheese (we bought it at a local farmer’s market here in Costa Rica) give it a special touch and tasty flavor. If you want to be very elaborate, you could also make an additional red sauce that we used for our vegan pizza. 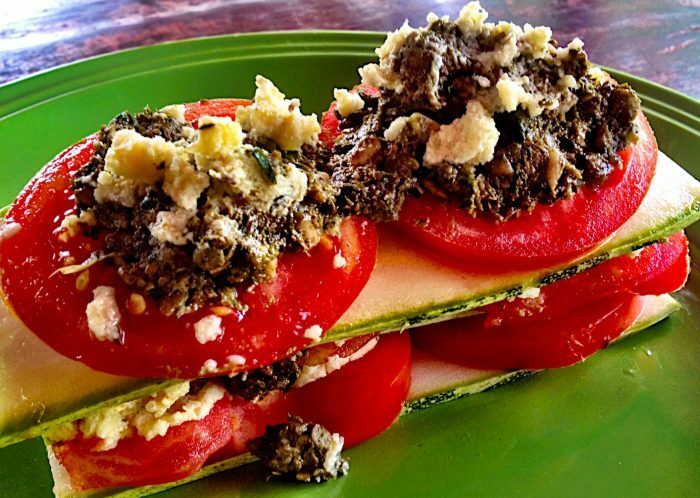 Cut the zucchini, tomatoes and cheese in thin slices. If you don’t have access to get vegan cheese, you can make your own. Check out the recipe here! Put the pesto ingredients in a high speed blender or food processor. Blend until you get a homogeneous paste. Add Himalaya salt to taste. To make the Lasagna, place a layer of zucchini slices on the bottom. Spread cheese over the zucchini and then add a layer of tomatoes. Put pesto on top. Repeat this for 3 more layers of zucchini, cheese, tomatoes and pesto. Prego! Enjoy your Lasagna with a nice side salat or some vegan crackers.